My biggest goal is to…DO something with these horrid kitchen counter’s that make me want to scream every time I see them! They are corian and I’ve been petrified to paint them myself for fear that it will come up in sheets. I just found this company and I’m calling today to get a quote. Has anyone had any experience with this company? #2 Rip up the carpet on my stairs and paint them. These are from my friend’s house. But, my most important goal is to create more traditions in our home. I heard Jen speak at a homeschool conference years ago about traditions and it has stayed with me. “Start by making your own home a place where happiness and love abound, through your love for each member of your family and for your neighbor. Try to put in the hearts of your children a love for home. Make them long to be with their families. So much sin could be avoided if our people really love their homes. Jump over to Nester’s to see some other home goals. I absolutely love that quote!! Mother Teresa was such a quiet woman but when she spoke she spoke volumes with just a few thoughtful words. I think your third goal of creating new traditions is a great one! Buuuut….I'm so excited to see what you do with your counters because we moved to a house with PEACH silestone. It's just about killin' me. Can't wait to see what you do with yours. What a beautiful quote – I'm going to write it down and post it! Thanks! Good luck with those counter tops….I look forward to seeing how they come out. We put in some new countertops last year..butcher block and so far I really like them….Thanks for sharing your goals. You always inspire me! 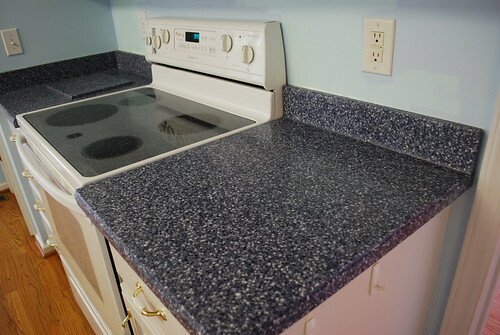 I lived with terrible counter tops for 7 years! You will be so happy when you change them. They look amazing were just the same type as yours and it was super cheap and easy- promise!!!!!! Just wondering why you don't like the Corian? I thought it was supposed to be high quality. Love the quote too. I'm a quote lover and that fit my goal perfectly! Cute pic of you and your daughter. Hope to meet you at Blissdom?? Oh how you convict me with that last goal! Beautiful quote! Kristi what a sweet & encouraging way to end a post. If I do nothing else in this life but instill love in my child, then I will be elated! I also want to thank you for featuring my slipcover in December. I talked about it today ..love reading about what you're up to! Love the painted stairs. 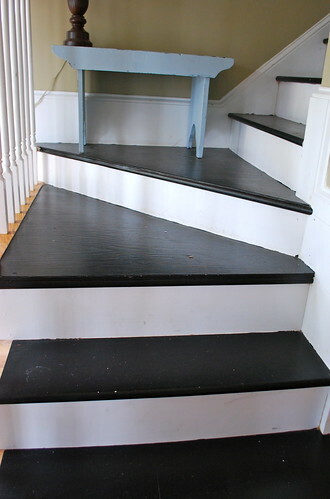 I have that same turn on the top of my stairs and it bugs me so much. So many people have fallen, even the dog. We must be klutzes. have you ever thought about painting the cupboards to better match the corian? Just wanted to let you know I saw a kit at Home Depot last week for countertops by Rustoleum. They looked pretty easy to do and with dramatic results. They also had kits for refinishing cabinets and I'm seriously considering it myself. Anyway, thought it might help you solve your issue and that you might want to look in to it. Save money in bathroom remodeling with the help of your bath refinishing experts. We do quality bathtub reglazing services at prices anyone can afford. Picking the perfect local company for your kitchen remodeling is a snap with AKDNY, New York’s choice for 15 years.